What is it about childhood that makes us adults so wary of who we once were? Perhaps it is that great fear of the unknown, a shadow, a whisper of adulthood that scares us as children into submission of these impending years. Perhaps it is remembering how we felt depleted before it began, when we were seemingly asked by no one and everyone, alike, to just stop being children because you have to grow up. We all remember that desire to just let us be. Let us be whatever it is that children are without those adult agendas. Gabrielle Demeestere's pivots such feelings, such moods, intangible and strange and so wonderfully potent with her feature debut Yosemite. Set in the fall of 1985 in the expanding Palo Alto, California, the film charts three intertwined stories of three 5th grade boys: Chris (Everett Meckler), Joe (Alec Mansky) and Ted (Calum John). 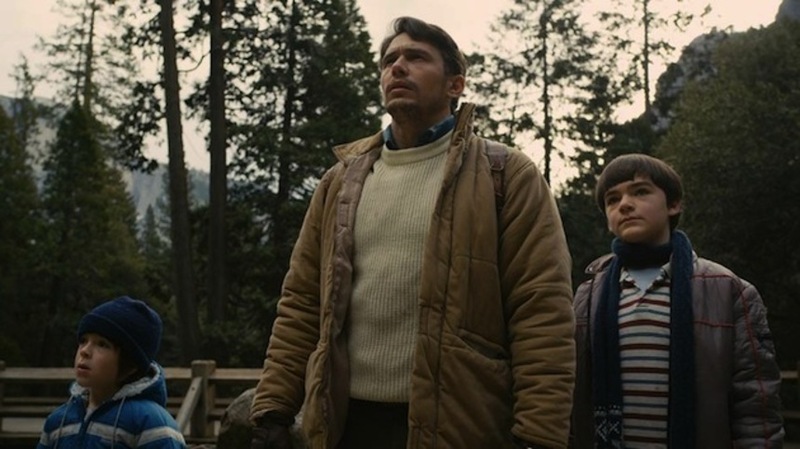 We begin with Chris, who goes on a weekend trip with his father (James Franco, who also executive produced through his Rabbit Bandini Productions) and little brother to Yosemite National Park. As the boys prepare for their first hike, the news on the radio talks of mountain lions coming invading human territory. Towns are on high alert. An ever encroaching natural world, fierce and different, colliding with the pleasant suburban living of Northern California emerges as a haunting metaphor for the looming shadow of adolescence: of something new. This unsettling feeling sits comfortably in the background of the film's length, never upending the gentle and intimate narratives of the boys' lives into something sensational or crass. On their hike, Chris finds a carcass burning in a fire. Is it a bear? Is it a man? It is encounters such as this that help give a rich sense to Demeestere's film but not an obvious definition. The second story follows Joe, Chris' classmate, a quiet child who makes friends with Henry (Henry Hopper), a young man who invites him over to read aloud his comics collection. Their relationship sits in that spot that is just as sweet as it is alarmingly uncomfortable. Our final story which eventually ties all three boys together follows Ted, who at one time had been close friends with Joe. The game Ted insists playing in class, where they pinch each other's penises under their desks results in Joe stabbing his friend with a pencil to the brow. As the threat of the mountain lion becomes all too real, Chris and Ted bond a little closer, while at nights Ted talks to his dad, a computer engineer and insomniac who chats to people over a proto-internet. Through these boys' tenuous friendships and their own loneliness, Demeestere demonstrates a deft touch working with child actors. All three boys give exceptional turns, each distinct in their desires, their fears, while certain big questions haunt them all. The specter of death, signifying change, runs its scythe across each frame. Reoccurring images of feet being cleansed by water, and prayers being whispered creates a subtle tapestry between all three stories that doesn't pronounce the film to have faith, but gives it a melancholic purity which clenches the heart. Joe Murphy's editing is careful not to intrude and manipulate too heavily on the boys' inner worlds. His cuts instead are guided by letting the boys' own small gestures guide the rhythm. This is also the general consensus behind the camera with cinematographers Chananun Chotrungroj and Bruce Thierry Cheung lensing with an indecisive, half-light as much as possible. This results in the film feeling both ever eternal, frozen in that golden moment of boyhood, with that uncertainty, that newness creeping up. When the boys decide to go and hunt the mountain lion in the brush and bramble, one might expect the movie's mood to suddenly shift to something more like Stand By Me, an adventure yarn inflected with rosy if cynical nostalgia. But it is Demeestere's choice to keep it of the moment that creates the film's ultimate resonance. For while the film may take place 30 years ago, it is now on screen, childhood is always now: these boys are just living their lives in wonder and pain. There is wisdom in that, I think. A wisdom which few filmmakers working with childhood stories seem to tap into. Céline Sciamma did it with the sexual malady of Tomboy, and now so has Demeestere with Yosemite. It's a mature debut that firmly plants the director as a phenomenal talent to watch.